We introduce ourselves as the leading manufacturers and exporters of filling machinery for various types of products like Granules,Powders, Viscous liquids, free flow liquids, Pickles. All our machines are designed in our state of the art computerized design center. Our Special Viscous Fillers can also handle difficult products like Pickle and Chyawanprash. 2. 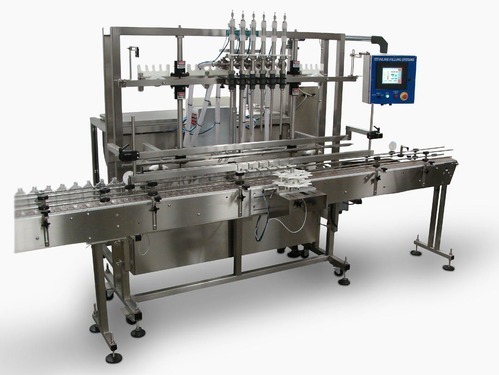 Auto/Semi Auto Viscous Liquid Filling Machine. (For Filling Jams,Sauces, Squashes, Food pastes, Chutneys, Ghee, Pharma Suspensions,Adhesives, Cosmetic Creams & Lotions). 3. Auto/Semi Auto Pickle-Paste Filling Machine. (For Filling all kinds of Pickles with Hard Pieces, Chawanprash, RTE Foods). 4. Auto/Semi Auto Powder Filling Machine (Servo Auger & Clutch-Brake Versions Available). ( For Filling all free flowing powders like Protein powders, Spices, Pesticide powders, Dry syrups, Readymade Tea-coffee premixes. 5. Auto/Semi Auto Granule Filling Machine. (For Filling all Free flowing granules like whole spices, Pesticide Granules, Pharma Granules, Seeds, Pulses). • Diving Nozzles for anti-foaming. • Shut-off Nozzles for Anti-drip. • Online Vacuum Cleaning of empty bottles. • UV treatment of containers for removal of bacteria in empty bottles. • Nitrogen Flushing for increasing the shelf life of the product filled. • Special Ramming devices for products like Pickle, Oil dosing for Pickles. • Auto online Lug Capping Machine. 2009-10 Rs. 1-2 Crore Approx. We are a reliable enterprise “Swanpack Packaging Machines Private Limited” incorporated in 2007 engaged in manufacturing, supplying and exporting Plug Pressing Machine, Accessories and Optional Equipment to the clients. Customers can avail from us Liquid Filling Machine, Granule Filling Machine, High Viscous Liquid Filling Machine, Powder Filling Machine, Pickle Filling Machine and Bag Filling Machine. Apart from these, we also offer Weigh-metric Filling Machine, Tube Filling Machine, Drum Filling Machines, Plug Pressing Machine, Lug Capping Machine, Screw Conveyor With Dump Yard and many more.These products are manufactured by a well-trained team of professionals using advanced facilities and quality raw material. All our products are appreciated for salient features like easy installation, dimensional accuracy, high strength and low maintenance cost. In order to complete all the undertaken tasks in a remarkable way, we have recruited a well-educated and experienced team of professionals, who precisely manufacture all our products. These professionals always keep themselves updated with all the rules, regulations and happenings of custom department to provide hassle-free products to our prestigious customers within the promised period of time. Our talented employees always keep in touch with the patrons to know that our products are as per their expectations and then bring the requisite changes accordingly. Owing to our fair business dealings and ethical practices, we have gained worldwide clients including the regions of Indian Subcontinent, East/Middle Africa, Middle East and South East Asia. Plot No. 56, Phase 3, I. D. A.